Check here for current tracks if available. Where in the world is Hubert?! 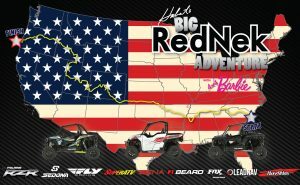 Hubert is making a one-of-a-kind-first-ever UTV trip from COAST to COAST, and here is what his route looks like. You can read all about the trip in the Big Adventure Press Release. Check out the Big Adventure page too! Hubert uses Leadnav Systems. Learn more. We love to hear your stories and see you photos, send a message and tell us what you’ve been up to! RedNek Racing posts to Instagram, Facebook and Twitter on the reg. Don’t miss out on the latest news!